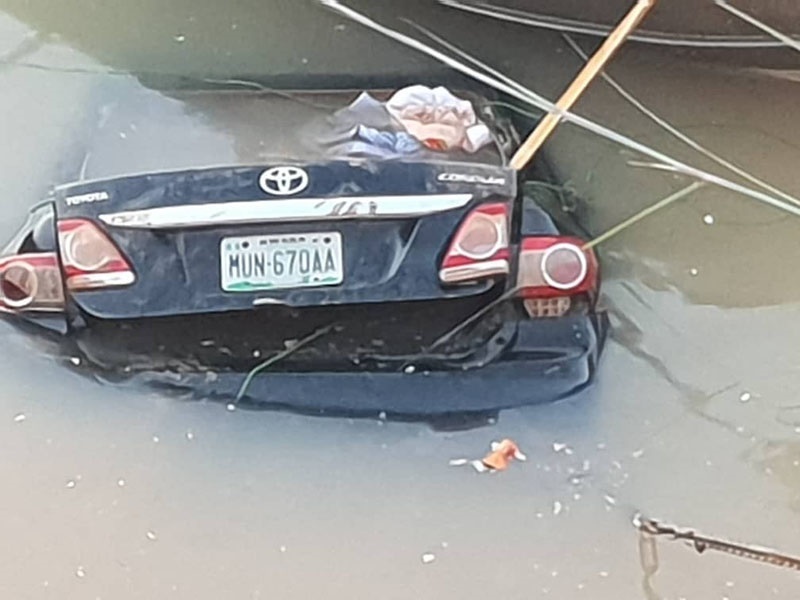 The vehicle of the missing Major General Idris Alkali found in a pond in Plateau State. The Nigerian Army said its officials in search of missing Major General Idris Alkali, have found a shallow grave where the man was buried in a place it called "No Man's Land". The Nigerian Army has released a report of its findings in its cordon and search operation conducted for a missing senior officer, Major General Idris Alkali (retired). A briefing on the report was held at the 3 Division Conference Room of the Nigerian Army in Jos, the capital of Plateau State, with the General Officer Commanding (GOC) 3 Division Major General Benson Akinroluyo giving the report. He said the military had discovered a shallow grave where the missing Major General was buried and also explained how it was found. Giving a breakdown of incidents that had happened before Alkali was declared missing, he said that on 2 September 2018, at about 8:00 p.m., unknown gunmen attacked a shopping complex located at Lafande Community on the outskirt of Jos metropolis in Dura-Du District of Jos South Local Government Area of Plateau State. "As a result of the attack, 11 people were killed while others sustained various degrees of injuries. "The attack triggered protest by the people of the area on the morning of 3 September 2018. "Irate youths in their hundreds trooped out, blocked the Eastern Bypass with stones and other dangerous objects. "The immediate past Chief of Administration (Army), Major General Idris Alkali who recently disengaged from the Nigerian Army after 35 years meritorious service to the Nigerian Army and the country was travelling from Abuja to Bauchi via Jos same day," Major General Akinroluyo said. According to the Army, the senior officer was travelling alone in his black Toyota Corolla car with registration number, KWARA MUN 670 AA. It said credible intelligence revealed that his car was stopped and he introduced himself as a general to the hoodlums who had barricaded the road that he was just passing through to Bauchi. "The senior officer was assaulted and killed. "Thereafter, his belongings such as clothing, cash, phones and laptop were shared by those who killed him. "His body was dragged before being moved to somewhere else and his car was driven and pushed into the abandoned mining pit filled with water. "The irate youths, who followed his car to the abandoned mining pit filled with water on many tri-cycles popularly known as “Keke NAPEP” jubilated for reason best known to them or for mission accomplished. "He was later buried in a shallow grave in an area popularly known as, “No man’s land” within the community," a statement of the report posted on the Nigerian Army Facebook page read. After the official was declared missing, the Headquarters 3 Division was tasked to conduct a search and rescue operation. The search and rescue operation was headed by the Commander 3 Division Garrison, Brigadier General Umar Muhammed. According to the Army, 4 different sources not known to each other at various times took the searching troops to the opened shallow grave where the senior officer was earlier buried but subsequently removed. Sniffer dogs that have been cultured with the personal effects of the senior officer were also engaged in the search and they led troops to the same opened shallow grave. "That was the only grave we were led to by different people and sniffer dogs. We did not go to any other grave, as the operation was carried out based on credible intelligence. "Like I always say, the cordon and search operation is intelligence driven and that is why the operation has been conducted in line with international best practices and respect for human rights," the GOC said. There have been accusations of rights' abuse, but the Army said it focused it activities on perpetrators. "This further explains why the Division did not clamp down on the entire community. Only the perpetrators are being targeted. "At this point, let me reiterate that all the actors involved in this dastardly act who are still at large are known to us. "All efforts are being made to get them arrested and be brought to justice as their photographs and personal details are with the relevant security agencies," the statement added.